In this particular seasoning we have decided to offer a bottle of the most asked about pepper in the world!! 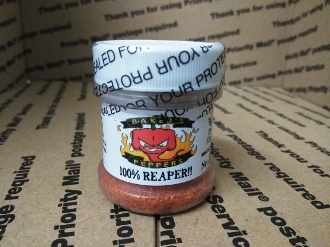 Its 100% "The REAPER" dried peppers ground up into powder! We then pour the powder into these shaker bottles and they end up holding just over 0.75oz of powder each. That is a LOT of heat packed into these convenient sized shaker bottles. These peppers have tested at OVER 2,200,000+ Scoville units, and have an average heat of about 1.7 million Scoville units. These bottles come shrink wrapped & sealed for freshness, as well as an 11 hole sifter included under the cap! These bottles are READY TO USE! !